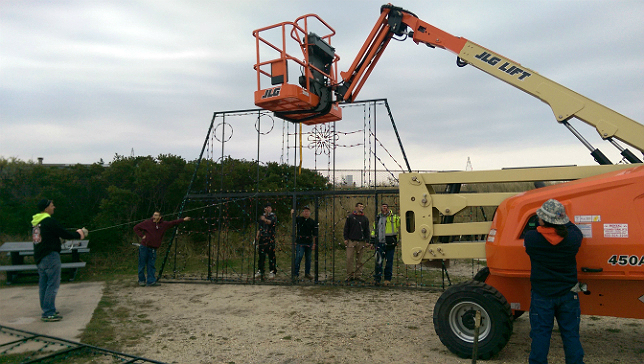 Now in its 13th year, the GSSC's Holiday Light Show has moved to Smith Point County Park to accommodate more visitors this holiday season. 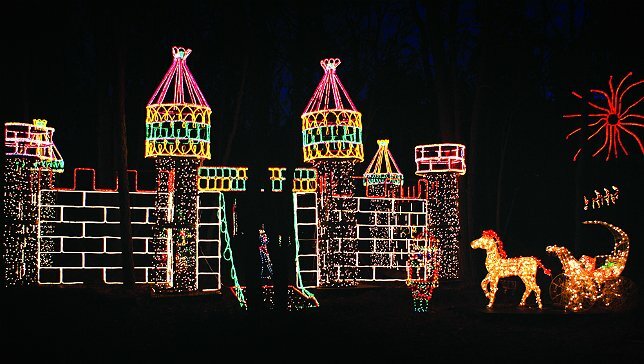 A dazzling light-up castle wows guests as they travel through the Girl Scout Holiday Light Show. With the cold winter season right around the corner, the Girl Scouts of Suffolk County are ready to warm the hearts of Long Islanders with the return of their annual Holiday Light Show, now celebrating its 13th year. 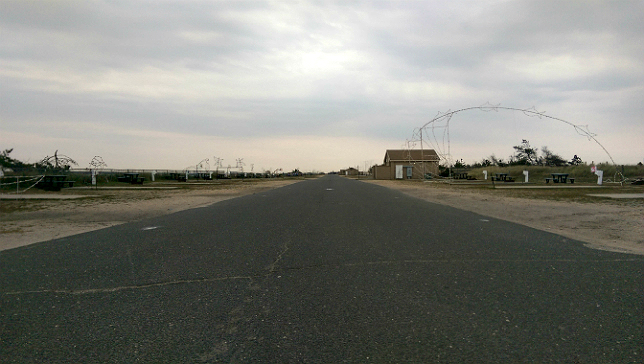 This long, lonely stretch of roadway at Smith Point County Park in Shirley will soon be lined with bright, vibrant holiday light displays. Running from December 1st to the 23rd, with additional dates between December 26th and 30th, and boasting a brand-new, larger venue this year, the Light Show is sure to be an improvement on an already popular event, and one sure to please those looking for a festive and family-friendly good time. A shot of one of the Holiday Light Show displays last year at Camp Edey in Bayport; this year, the Girl Scouts' new location at Smith Point County Park in Shirley promises to be bigger and better. Image courtesy of the GSSC. Previously held for the last 12 years at Camp Edey in Bayport, the fundraising attraction consists of a drive-thru show featuring numerous and varied displays, all reflecting warm and cheery holiday-themed scenes bathed in the warm glow of colorful electric light. 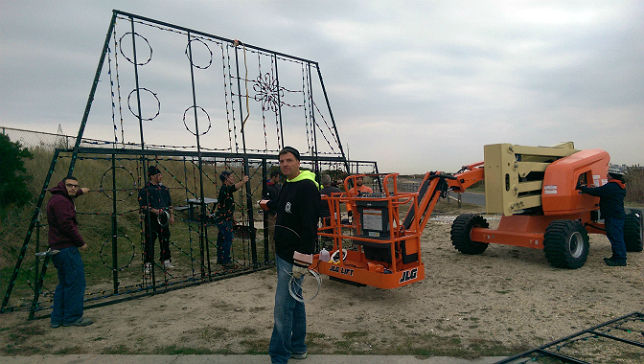 Workers and volunteers toiling hard to put together the displays for the Girl Scouts' Holiday Light Show. 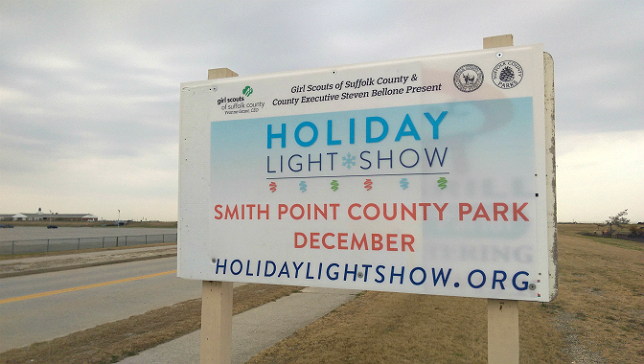 However, citing a need to expand the scope of the event as well as a desire for a more isolated location to avoid bothering neighboring residents, the Girl Scouts of Suffolk County, in partnership with Suffolk County Executive Steve Bellone, have moved the light show to the expansive campground at Smith Point County Park in Shirley this year. 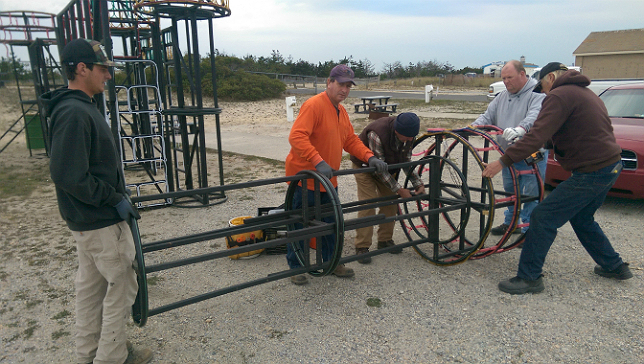 “We're going to have over 50 displays lay it out over a mile and a half long stretch of road in the campground area of Smith Point County Park,” said Suffolk Girl Scouts Director of Public Relations Christine Terzella. A shot of Light House at the Holiday Light Show displays last year at Camp Edey in Bayport. Image courtesy of the GSSC. Tying in music to add to the yuletide charm of the light show, Terzella noted that the Girl Scouts are teaming up with radio station WBLI to provide a frequency that car radios can tune into so they can listen to holiday music as they slowly traverse the Smith Point campground while taking in the glorious sights. 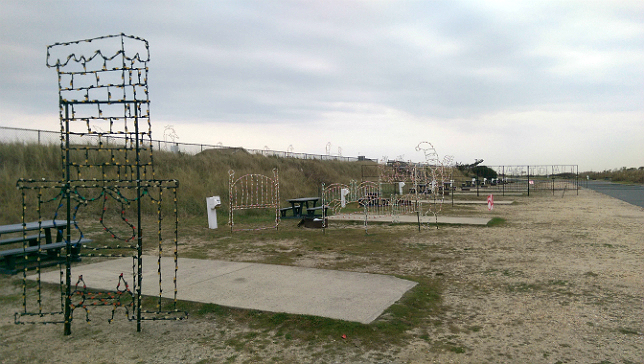 The new location of the Girl Scouts of Suffolk County's Holiday Light Show is at Smith Point County Park in Shirley. Image courtesy of the GSSC. When looking for a new location to transplant their Light Show to, Terzella said that Steve Bellone and his administration were more than receptive to helping them find a new venue; Smith Point was deemed perfect, as there was more than enough room to accommodate a much larger set-up. 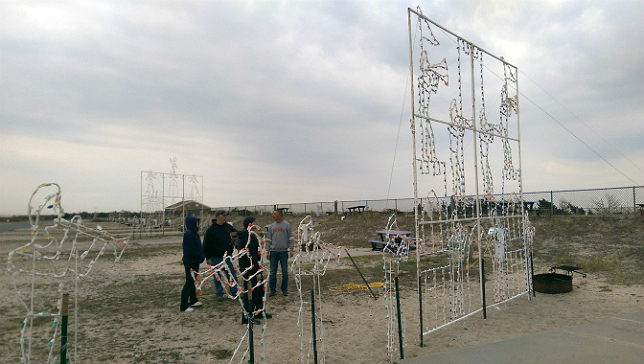 Workers and volunteers putting together the displays for the Girl Scouts' Holiday Light Show. Terzella said that all of the holiday attractions featured in the show are leased from a lighting display company. 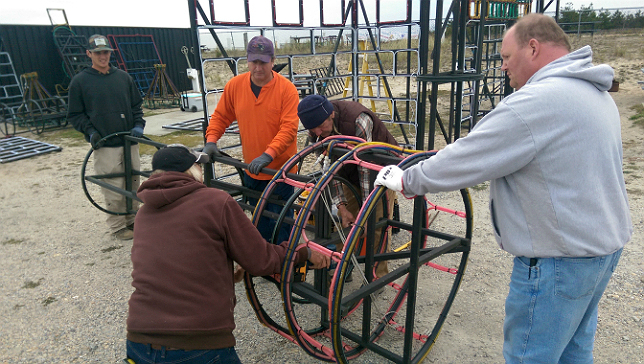 The huge job of setting up the countless wires, bulbs, and frames at the Smith Point campground began on Nov. 7th; work is being carried out by local union workers, electrical contractors, PSEG employees, and numerous volunteers, with work expected to last until Nov. 11th at the latest. 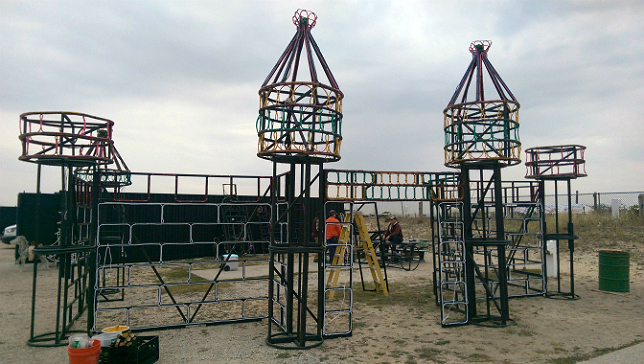 A 3-D light-up castle being set up for the Girl Scouts' 13th annual Holiday Light Show. Among the displays featured in the light show are a large three-dimensional castle, a lighthouse, a city skyline, and many other lovely pieces – many non-denominational – that are all sure to evoke the happiness, joy, and good tidings customarily associated with the holiday season. When darkness falls, this scene will be awash in colorful and festive light, dazzling attendees at the Girl Scouts' Holiday Light Show. Previously, attendees were required to reserve a time to arrive, but Terzella said that this year, thanks to the larger and more isolated location of the show, admittance is on a first-come, first serve basis. All vehicles cost $20, except for school or coach buses, which cost $70. Only credit cards are being accepted at this time, with the fee payable upon arrival at the park. Santa doesn't forget about the kids in more tropical regions. Image courtesy of the GSSC. The annual Holiday Light Show serves as one of the Girl Scouts of Suffolk County's major annual fundraising efforts; the goal of the Girl Scouts, Terzella said, is to be a helpful force in their community, and great events like this one allow them the important financial backing to continue that mission year-round. “The Girl Scouts of Suffolk County serve more than 40,000 girls and their families, and we have more than 7,000 adult volunteers,” she said. For more information on the Girl Scouts of Suffolk County's 13th annual Holiday Light Show, click here. Subject: LongIsland.com - Your Name sent you Article details of "Girl Scouts of Suffolk County's 13th Annual Holiday Light Show Moves to Smith Point County Park"